But, no, these were declarative statements (with the unspoken implication being that I am either a liar or a fool). 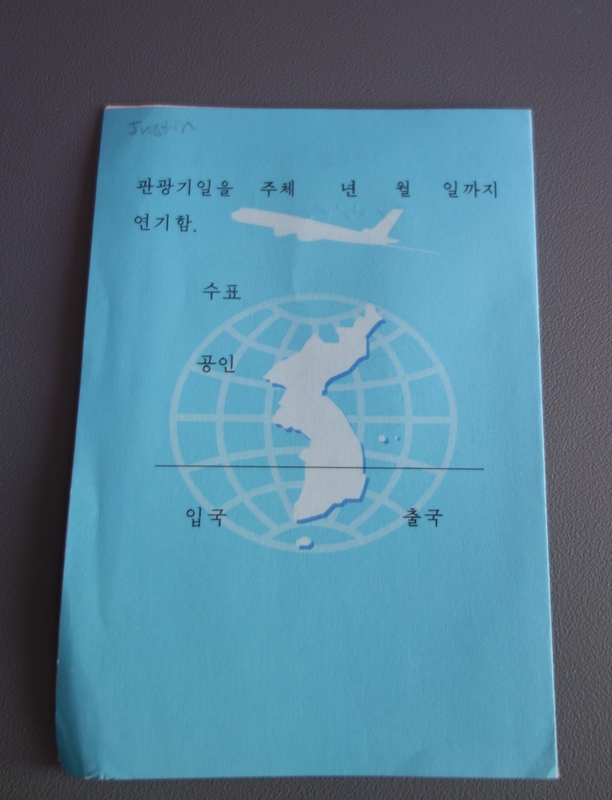 Perhaps most notable (and the most adamant) among these doubters was the passport control agent at SFO who insisted that I could not have entered North Korea without special permission and demanded to see my paperwork regarding this special permission. After I persisted in the face of his escalating threats, he finally went to his supervisor, who confirmed that, yes, it is possible to visit North Korea. Unfortunately, rather than admit he was mistaken, the agent still sent me along for further questioning and flagged my luggage for a heavy duty search and inspection. Ha, as I have long maintained, the less inclined a man is to make declarative statements, the less apt he is to look foolish in hindsight. 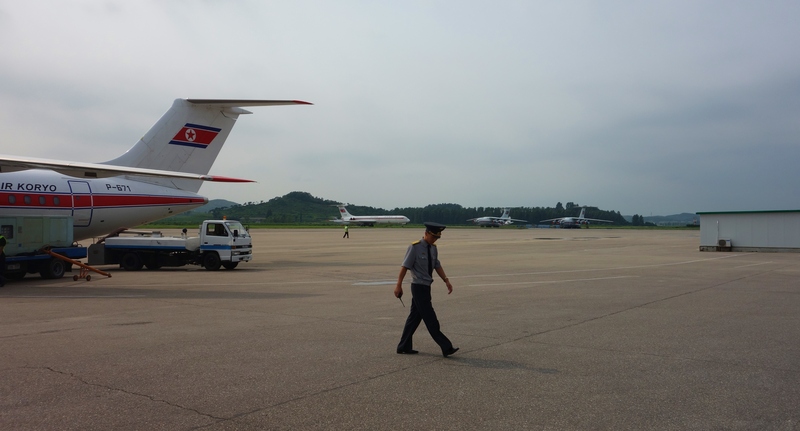 The reality is that it is remarkably easy to visit North Korea. In fact, it proved to be far more of a headache to obtain the Chinese visa than the North Korean visa. Now, Western visitors to North Korea (for the record, the North Koreans prefer to have North Korea referred to simply as “Korea” or the “Democratic People’s Republic of Korea”) must be accompanied by North Korean guides at all times and follow a regimented itinerary. One cannot travel on their own at all. But one can certainly still visit the country and have a good time. And, frankly, even with the guides, I was amazed on a couple of occasions at how much freedom we were granted given the country’s reputation (I’ll discuss one of those instances in the future). It does not matter even if you are American or British. The only restriction that Americans now have is that they are not permitted to take a train in or out of the country, but instead must fly in. So, here’s how a trip to North Korea works… To facilitate your visit, one picks a company (Western or Chinese) that has approval (from the North Korean government) to organize tours to North Korea. The company we went with was Young Pioneer Tours (YPT) – based on price and the vibe of the company – and I believe they did a good job. Several North Korean companies (controlled by the government) provide guides once one arrives in the Democratic People’s Republic of Korea (DPRK). So, the first company (YPT for us) will take your money, sort out your visa and make all of the arrangements to get you into North Korea. Then, once inside the DPRK, you’ll have a Western guide from YPT with you (or whichever company you may have selected), but they will be working under KITC as KITC will be directing things once you are inside Korea. On our visit, KITC sent a male and female guide as well as a female guide working as an intern along with a driver and a girl with a camera to document our visit. If the process sounds complicated, it really isn’t. And you don’t need to worry about it anyway since the tour company you contact will take care of everything. One important thing to understand is that the itineraries outlined by the various tour companies are proposals, but are not guaranteed. What one sees in North Korea is entirely at the discretion of the Korean government and their KITC representatives and these itineraries are not set in stone. So, you may do things in a different order than the proposed itinerary or things may get dropped and replaced with other events or activities. You just have to go with the flow. This is true for all groups that go into North Korea, so don’t just pick a tour based entirely on the itinerary they outline on their website. One can also arrange for private tours following the same process outlined above (contact YPT or another company who will arrange things with KITC) in which you only have the Korean guides and not a Western guide, but these are exponentially more pricey and one visits all of the same sites anyway. So, I don’t really see the point. 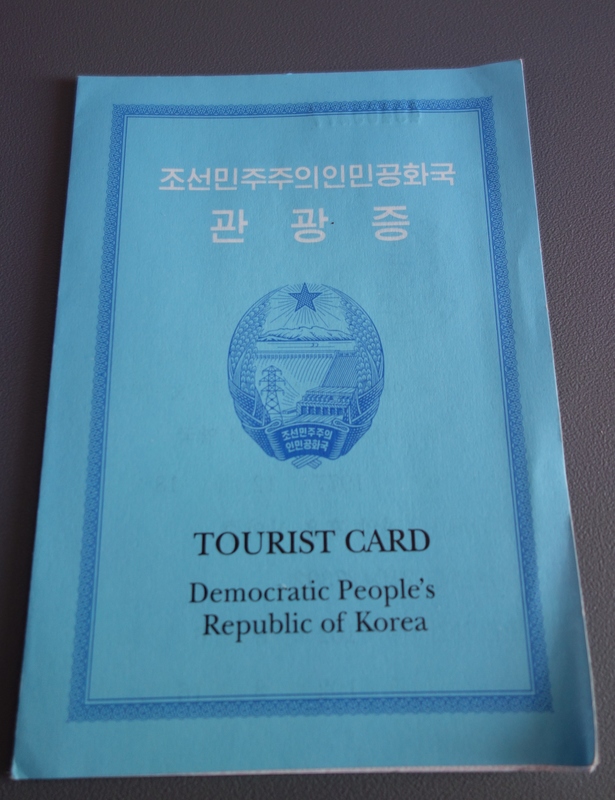 Below is what the North Korean visa or tourist card looks like… Unfortunately, the Koreans take it back from you when you leave and they stamp this card instead of your passport. So, no cool stamps or visas in your passport from the DPRK. 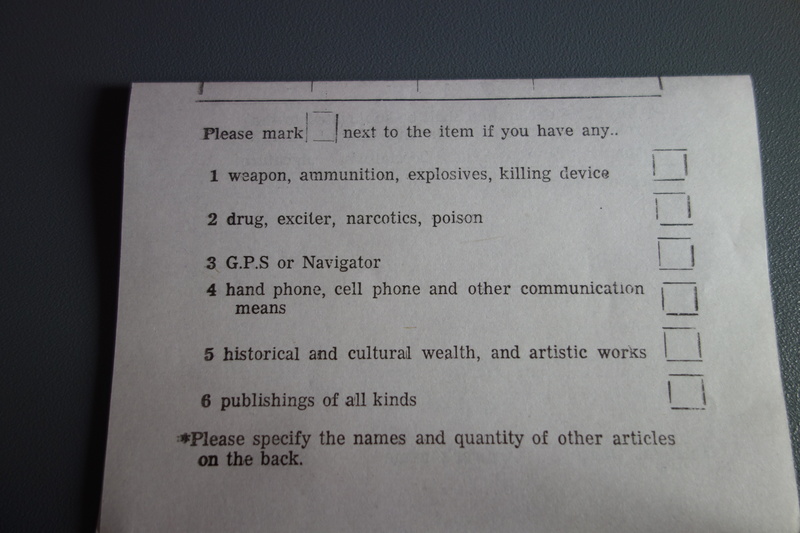 During the flight into the DPRK, one is also provided with the following immigration form to fill out and present upon arrival… I did wonder what an “exciter” was. 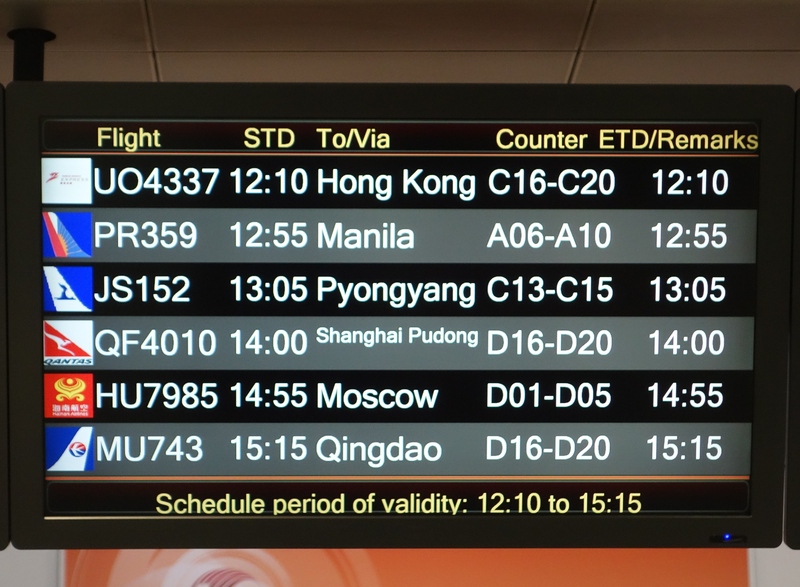 The flight from Beijing to Pyongyang on Air Koryo is about an hour and a half. We were on a Russian Antonov and it didn’t have screens on the back of the seats, but you are provided with DPRK official newspapers and news magazines on the flight so one is not deprived of mental stimulation (You may detect – ahem – a slight bias in the news coverage though). Also, some of your fellow passengers might be interesting to talk to. The runway in North Korea is pretty rough and so it is good to have the sturdy Russian planes. Some good views of the countryside can be had as one descends for landing. The airport isn’t exactly JFK or Heathrow, which is nice because one doesn’t need to stand in line or battle crowds. Passport control is more of a formality as the North Koreans are actually extremely mellow about the whole process. They’ll stamp your tourist card and check your phone (to make sure that you bring the same phone out of the country). Then one proceeds through customs (you go through a metal detector and your luggage gets x-rayed, but no one really cares or is paying much attention). After that, you are done. The whole process takes about five minutes. The drive from the airport to the center of Pyongyang is about 20-30 minutes. And there you have it. 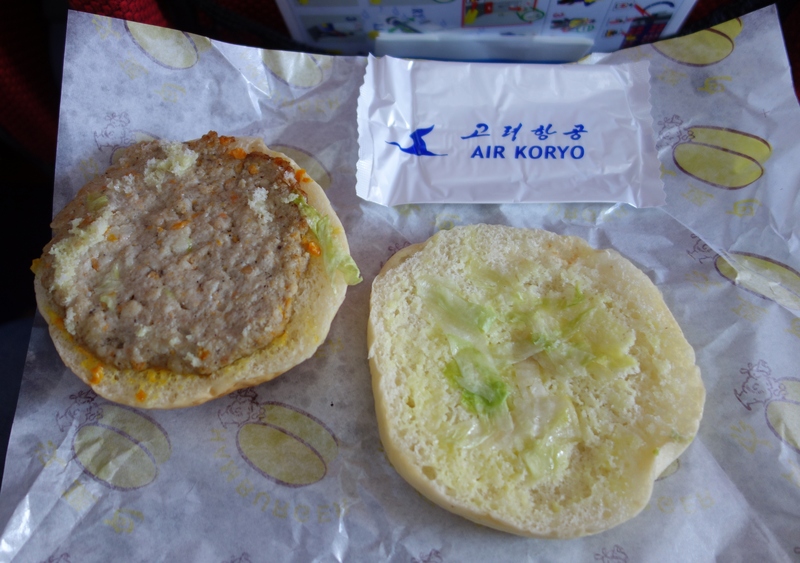 It really is that easy to visit the unspoiled lands of North Korea. 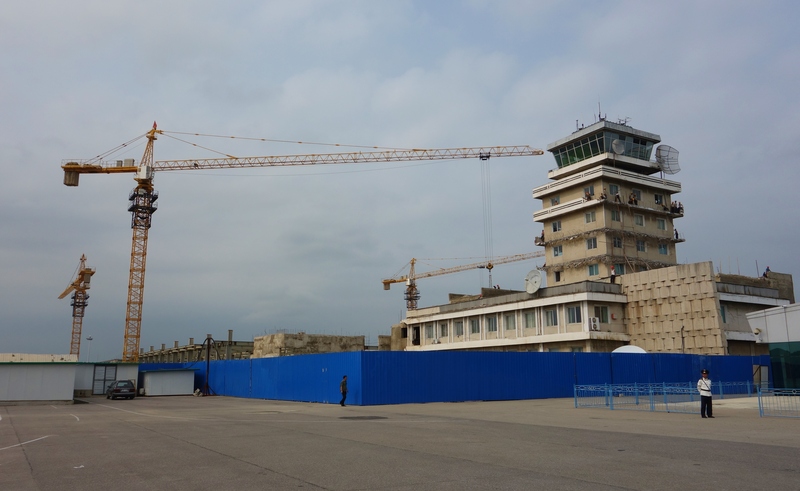 Tags: Eleonora Ames, Entering North Korea, Justin Ames, KITC, North Korea, Pyongyang Sunan International Airport, Stana Ferrari, Young Pioneer Tours. Bookmark the permalink. Loooved this ! :) Too bad we didn’t get our passports stamped. I hope you will visit my nephew Liam Andrews. He is there and has been for years. In North Korea? What is your nephew doing there? This is really good to know! Thanks for posting all the details! You’re welcome, Cassie. Thanks for stopping by. As for passport stamps, i read that ‘you can have a visa attached to your passport’ but in this case, you need to have it issued at a North-Korean Embassy in addition to Beijing. I guess there is no institution like that in the US, but is in Germany, or many other countries. Actually, based on a site, you can have a visa attached to your passport. 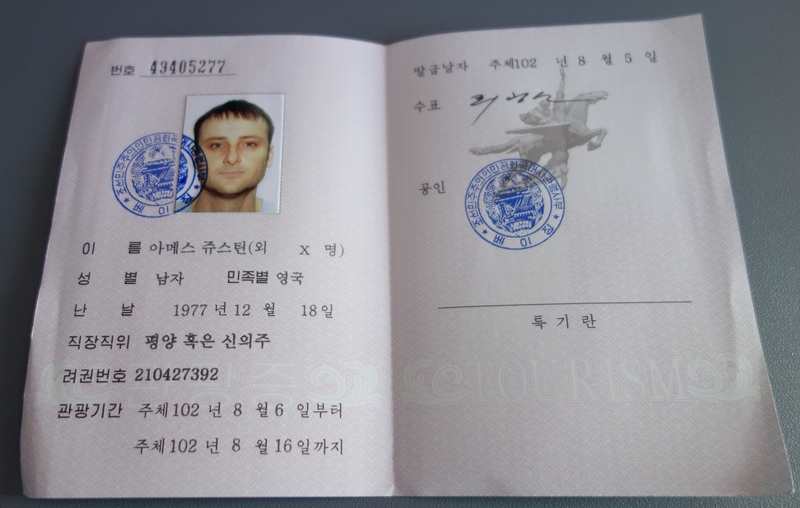 You just have to post your passport to a DPRK embassy(which i guess can not be found in the US, but in many other european countries) and pay EUR40 for the process. They will send it back to you after about 3 weeks.